Hey, friends, and happy August! Today I’m sharing a slightly different ‘Kristen Reads’ post, including 4 Christian books I bought this month. With all the traveling I did in July, I stuck with more e-books on my iPad than physical books, so the ‘to be read’ pile has stacked up! Also, be sure to check out my video below for my thoughts on these books I’ll be reading soon. I was sent this book in exchange for my honest review as a B&H Book Blogger. I haven’t read it yet, but I’m excited to based on the tagline & back of the book. I’ve been into a lot more Christian books lately, and I’ve enjoyed all the B&H books I’ve read so far. If ya didn’t pick up on my excitement from talking about this book in the video, I was so happy to get my hands on this one! Grace Valentine just graduated from college, and she just published her first book! She is killin’ it in terms of dream-chasing, and I so admire her for that. I had to buy this one and support a fellow Christian college writer/blogger! This is another one I was excited to get! I just started reading this one on my trip to Dallas and I love it already. Lysa’s books have been some of my favorites this year and I think this is one of her most popular books, at least from what I’ve seen online. Woo!!! This is the book I’ll be giving away soon for my 2-year-blog-anniversary giveaway, so get excited! Two lucky winners will get to share in the goodness and grace of this sweet read. This book will touch your soul and help mend your heart from all those ‘uninvited’ moments where we feel less than and unloved. It’s a tear-jerker, for sure. There you have it! Those are the 4 Christian books I bought this month, and some of the next ones I’ll be reading. 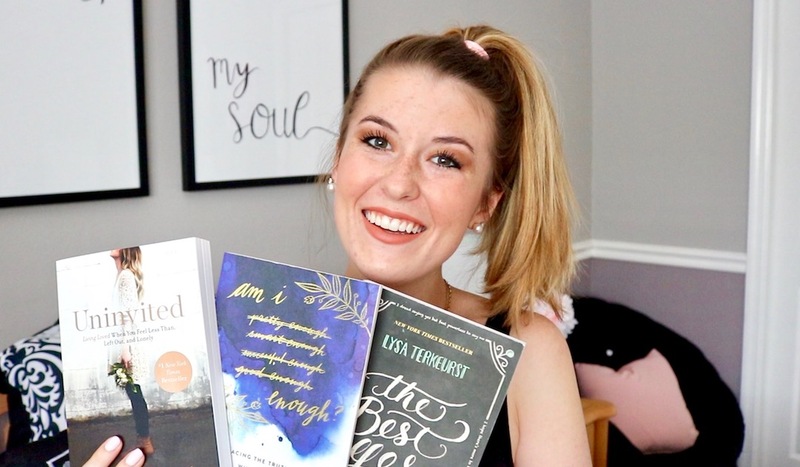 I’d recommend any of these books for Christian women, and I encourage you to check out Grace’s ministry, and all the incredible light she is sharing. Thanks for being here, friend!